In a medium bowl, mash together ground lamb, breadcrumbs, egg, salt and pepper. Form small meatballs out of the mixture. You should get 20-24 meatballs. Heat oil in a large skillet over medium heat. Once oil is hot, add meatballs in batches and brown on all sides. When browned, remove meatballs from the pan and add 2 cups water. Use water to scrape up any bits on the pan. 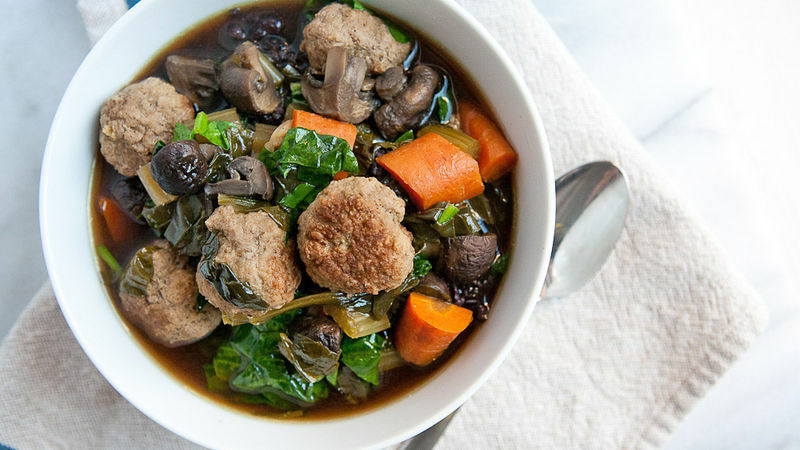 In a large slow cooker, add meatballs with all chopped veggies, bay leaves and garlic. Pour in liquid from skillet and the beef stock. The liquid should cover the ingredients. Cover and cook on low for at least 5 hours. When ready to serve, cook wild rice separately according to instructions on package. 5 minutes before serving, add chopped spinach to slow cooker and stir it in so it wilts slightly. Season stew with salt and pepper. For serving, spoon 1/3 to 1/2 cup wild rice into the bottom of a bowl. Ladle on stew, being sure to get some meatballs, veggies and broth in each bowl. If you can't find ground lamb, lean ground beef is a fine substitute. This stew will change your view on what a savoury slow cooker stew can be.